The Secretary General for European Affairs, Panagiotis Pavlopoulos, and Germany’s Minister of State for Europe, Michael Roth, discussed the positive prospects that arise following Greece's return to normalcy, as well as its role in the region upon entry into force of the Prespa Agreement. 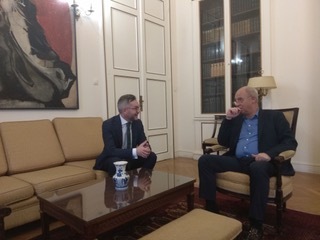 During their meeting held at the Ministry of Foreign Affairs, they also examined the political developments and processes in Europe especially the upcoming European elections, as well as the major and pressing open issues for the European Union, such as the deepening of the Eurozone and the new 2021-2027 Multiannual Financial Framework, which is under development. 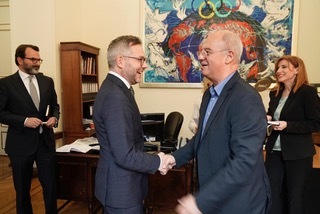 They agreed that the necessary reforms in the Eurozone will have to be in line with strengthening of its democratic institutions and that the new multiannual European budget will have to deal with the expanded economic and social inequalities within the Union and its Member States. Similarly, the expressed the common position that no margin exists for renegotiation of the agreement for the United Kingdom to leave the European Union.